Some of you have asked if we ever have some healthy dishes. Here's a salad that is chopped full of powerhouse nutrients. I have joined a group of ladies this past fall, for a 7-week challenge. No junk food nor refined sugars. Truly this has been a challenge, but I've noticed how quickly those extra pounds can sneak on. So this week I chose kale and quinoa. I'm very content to eat the same old, but during this time I challenged my self to eat healthier and wiser, hoping to see some beneficial results. 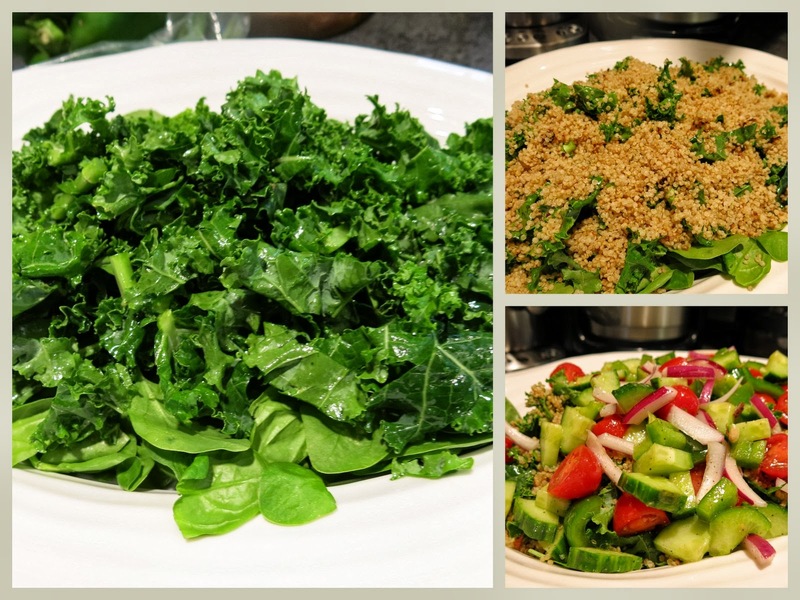 Kale is known as one of the powerhouse of nutrients, high in antioxidants. Quinoa is also known as an ancient grain which is high in fiber and protein and very low in fat and it's gluten free. You'll notice that we only use olive oil and lemon juice for the dressing, keeping things light. Cook quinoa as per instructions. I cooked my quinoa in my rice cooker. Layer spinach on the bottom of the platter. Chop up kale and drizzle pure olive oil on leaves. It gives a perfect healthy shine. Combine kale and spinach to form a bed of greens. Spoon cooked quinoa on greens. Combine cucumbers, tomatoes and onions in bowl and mix well with 1/4 cup olive oil. Optional: Top with some freshly cooked shrimp. Take your lemon pieces and drizzle juice over the whole salad. Add your favorite seasoning spice on top. Let the juices and oil marinate your salad. It's simple, nutritious and it's paid off. Marg, that looks insanely delicious :) I feel this is great time of year to lighten up, making room for the extra pounds we tend to accumulate through the holidays. Wishing you well in this challenge! Oh that sounds like a challenge I should be joining you on!!! 7 weeks - let's see now - that takes me to boxing day - eek! I love quinoa and don't make it often enough. Looks amazing. I have been on a high protein / vegetable diet for the past 6 1/2 months and have lost over 73 pounds to date. I have been eating lean meats and have added vegetables to my diet that I did not use before ... kale and zucchini being two of them. This salad looks absolutely delicious. I also substitute cauliflower in place of potatoes or rice. The taste is pretty much the same and as long as the texture matches, you hardly can tell the difference.